The SBA has just announced a new 25 year SBA 504 loan option. The new fixed rate loan is now available and is in addition to the current 10 and 20 year loans. 25 year terms are available on loans approved after April 2, 2018. 20 year loans approved after April 2, 2018 may be extended to 25 years. Voluntary prepayments remain at 10 years for 25 year loans, the same as 20 year loans. Prepayments after 10 years may be made without penalty. The term of the Third Party Loan accompanying the 25 year SBA 504 loan must be at least 10 years. The fee structure is the same as the 20 year loans. The first pooling for 25 year debentures will occur no earlier than July, 2018. 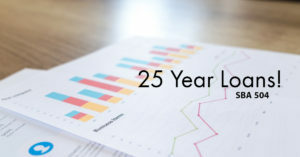 Rates for the 25 year debenture are determined at the time of funding and are anticipated to be set at a spread above the 20 year debenture rate. Actual rates will be known after the debentures are presented for sale.